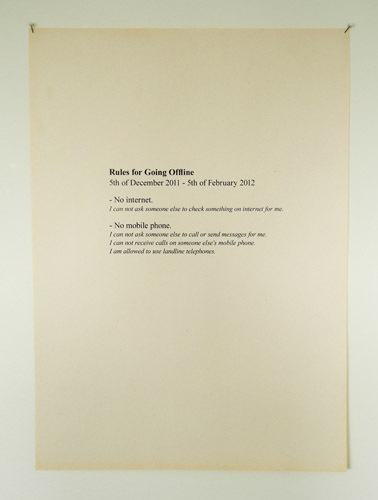 Going Offline took place between December 5th 2011 and February 5th 2012 in Stockholm, Gothenburg, Gävle, Falun, Svärdsjö, Sälen, Avesta, places in between, and places I do not know of. In other words, it is an artwork that took place in different contexts. As a result it also addressed different audiences in all these situations. The work occurred outside the walls of the traditional art space (except for the times I attended art exhibitions) and included preparation, performances, presentations and documentations. The work consisted of me going offline, e.g. not using the Internet and mobile phones during two months. Everything that were affected by the disconnection are considered to be part of the work. My interest in Going Offline was twofold. (1) I wanted to investigate how the entrance of a new (virtual) space had affected our understanding of the concepts of space, time and body. (2) I wanted to, in a hands on manner, create a small bug in an otherwise well functioning, fast and effective system of communication. In other words to intervene the course of events in my everyday life to affect myself and others connected to it. Like the small stone thrown into the water creating rings (movements) on the surface, where the closest one, which is the most vigorous, influences the next one and so on. Overall I aimed to explore the sole individual’s connection to social structures and global phenomena. There are almost no physical results of the work, only experiences, stories and knowledge, but a logbook kept during the period was later on used to create another work (+46707140330, see "works").